Now available due to demand! So, installing our standard lines does not sound like too much fun for a Saturday afternoon, especially with the Oil Pan installed? Well, we have a solution just for you. These lines are true quick connect, available in two-connect hoses for just the engine side, or four-connect for both engine and cooler sides of the hose assemblies. Just remove the OE lines and adapters, clean the ports, screw in the new adapters, pop the hose in place, and lock the clamps over the top and you are all set! These clamps are tool-less, triple-locked, and also have a safety strap- they cannot disconnect on their own, but will easily separate in a pinch when you want them apart. These are FULL FLOW, they have no valves, and no restrictions. They flow far better than OEM lines and adapters, anyone who has a Gen-3 or later car with a few miles on it surely knows how annoying the factory lines can be as they slowly seep oil all over the place... and that's a best case scenario. We have seen more than one that decided to disconnect itself or fail catastrophically, and cost the owner an engine. I realize these replacement lines are expensive, but they are made from only the best materials available, and the best is not cheap to produce. I encourage anyone considering these types of lines to weigh the installation time and costs, and especially racing applications where engine removal is a normal occurrence, when comparing to standard lines. A 3 hour install with busted knuckles becomes a 30 minute install with this line type, and literal minutes of service time after the adapters are installed. So far as materials, these oil lines are the top of the heap, and are quite literally the latest technology available. The base hose is HS79 with a CSM cover, which is a 5-layer type hose. It is Teflon lined silicone hose with a layer of stainless steel reinforcing wire, covered in an Aramid weave, and then covered in a molded rubber CSM layer. They are very light weight, do not permeate odors or fluids, very flexible, and extremely abrasion resistant. All ends are Crimp type, and are black anodized and Super-Nickel. 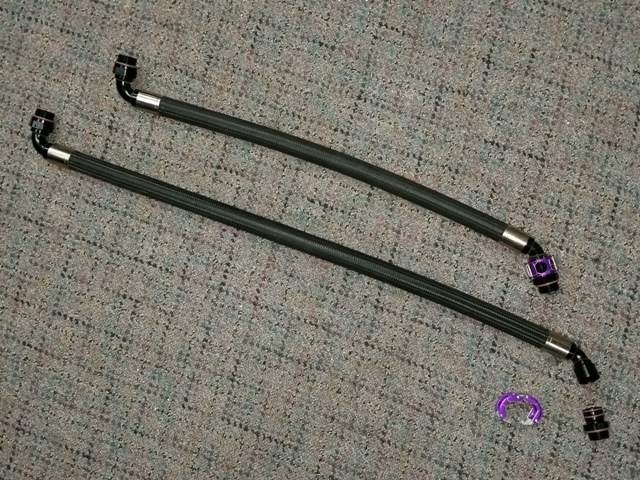 Quick connects are dual O-Ring, and clamps are aluminum and stainless steel. If applicable, the direct port ORB hose ends on the cooler side eliminate the use of any separate adapters. Note: When comparing HS79-CSM and Pro-Plus hoses, they both are the very top-shelf of product offerings. HS79-CSM is more abrasion resistant and has a very visually appealing appearance, slightly more flexible, slightly higher flow rate, and has a slightly higher temperature rating. Pro-Plus however is more reasonably priced, still more than adequate for the applications, and of course far superior to OEM components. One benefit of Pro-Plus is that a given hose size/flow rate will be smaller in total outer diameter than a comparable line of other types. A -10 sized Pro-Plus hose will be roughly the same external diameter as a -8 sized HS79, Aeroquip, or other standard size hose offering. This helps in space limited applications, and is due to the fact that Pro-Plus uses a constant ID on fittings and lines with the use of press-fit and crimped hose ends, rather than slip-fit oversized hoses in other applications where the hose ID is larger than the fitting ID. Please select Model Year below.